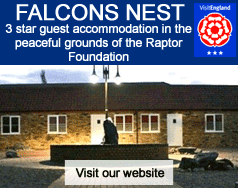 As a registered charity the Raptor Foundation welcomes members and the support that they give. By becoming a member you will be directly supporting our hospital and the vital work that it does in rescuing and rehabilitating birds of prey as well as many other projects. More than just a membership…. This offer is valid for the named Annual membership holder only and is not transferable. Additional proof of ID may be required upon entry. This offer is not valid on special events or public holidays. Please check with the zoo/park you are visiting as to specific opening hours and event days. To benefit from this offer your membership card must be presented at the park/zoo admissions on arrival. Refunds or discounts cannot be given retrospectively.